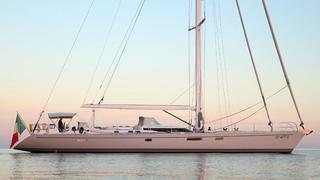 23.47m sailing superyacht Vanina has been sold in an in-house deal by Haas International. Vanina was built by French superyacht yard CNB to a design by Philippe Briand and delivered in 2010, featuring an aluminium hull with a vacuum infused composite superstructure for passage making in comfort and safety. A cutter-rigged performance cruising sloop, her sail handling is enhanced by electro-hydraulic furling for all sails coupled with a Harken electric winch system. Other features include double cockpits with twin helm positions and a main saloon with a Samsung 32 inch television and Bose surround sound system. An interior by Herve Couedel accommodates six guests in a large forward main suite and two guest cabins, all with en suite bathroom facilities. Easily handled by a small, shorthanded crew, she has been immaculately maintained since new and is powered by a single 180hp Volvo engine. Vanina was asking €1.4 million with VAT paid.